CES 2012: Krell unveils new integrated and preamp models | What Hi-Fi? New from Krell here at CES 2012 are the stereo Phantom III preamplifier and S-550i integrated amp. Both models are due on sale in the second quarter of 2012, and will retail for $5000 each. The Phantom III – one of our Stars of CES 2012 – is the first Krell preamp to include an optional digital input module and a headphone input. The digital module features AES/EBU, coaxial and optical digital inputs for use with streaming devices or other digital sources. Under the lid it's a dual monaural design with individual power supplies and circuit boards for the left and right channels. The headphone circuitry is identical to the maincircuitry, offering the same performance when listening through headphones as speaker playback. The digital module supports up to 24-bit/192kHz audio. It's available for an extra $1000. Joining the Phantom III is Krell's S-550i integrated amp (above). 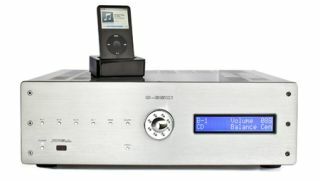 It includes an iPod dock, balanced and single-ended inputs, RS-232 connectivity and a preamp section using circuit concepts from the Phantom preamp.